In the 15 years that I’ve been running a small company, I have survived several malware attacks. The only thing that kept me in business was a reliable backup of my data. When it comes to my data (if not my pants), I’m a belt and suspenders kind of person: In addition to periodically copying my two key work folders onto an external hard drive, my system automatically backs up my computer’s contents to an encrypted cloud-based backup service at 1 o’clock every morning. If I’m attacked or my main computer goes south, I won’t lose my company’s 40.9GB of data, even if some catastrophe destroys both the computer and the external hard drive. More than once, I have used the backups to save my digital bacon by retrieving a deleted file, and the online backup has the added convenience of letting me use just about any connected device to access a document and show it to a client during a remote meeting. For this evaluation, I looked at products from four top vendors in the online backup world, according to Goodwin: Mozy, Carbonite, Acronis and IDrive. I also tested a fifth product, Code42’s CrashPlan for Home, but after the review was done and before publication, Code42 announced that it is phasing out CrashPlan for Home and will stop selling that product as of Oct. 23. We removed that review from the story, but we do provide some details about CrashPlan’s surviving small-business product below. As Code42 phases out CrashPlan for Home (new subscriptions will not be sold starting on Oct. 23), it is recommending that existing customers migrate to CrashPlan for Small Business or to its “exclusive partner,” Carbonite. We’ve already told you about Carbonite, but here are some pertinent things to know about CrashPlan for Small Business. Pricing is $10 per month per device, but you get unlimited storage and no file-type restrictions, and any external hard drives connected to a device are backed up at no extra charge. Linux devices can be backed up, which is rare among the services tested. Deleted files are kept available, unless you specifically ask that they be truly deleted. CrashPlan offers AES-256 encryption and a private key option. Of the four remaining products, Carbonite offers unlimited storage but restricts the types of files you can back up. Acronis, IDrive and Mozy charge on a per-gigabyte basis but are less restrictive about what you can save. One thing all of the vendors share is an emphasis on security, with data encrypted both in transit and during storage on their servers. Acronis goes a step further by using blockchain technology to make sure that the backup you need to rebuild your system hasn’t been tampered with. To evaluate these online backup services, I timed a series of backups and file restorations using a Windows 10 laptop. I then timed how long it took to retrieve a file stored in the cloud to an Android tablet. (The Android results are given throughout the story, but Mac results were similar.) See “How I tested” for details. The results were eye-opening. Read on to find out why. Acronis True Image 2018 offers fast backups and extras such as top security and the innovative integration of the blockchain technology used by the bitcoin cryptocurrency. Acronis offers a 30-day free trial. There are two subscription online backup services, Advanced and Premium, either of which you can purchase for one, three or five computers. (There’s also a Standard option that doesn’t include online backup and has no annual fees.) The Advanced edition includes backup and recovery, disk cloning, mobile device backup, social media backup and cloud storage of up to 250GB for $50 per year. The Premium edition, which I reviewed, adds electronic signatures for documents and Blockchain verification that the archives haven’t been altered. It comes with 1TB of online storage and costs $100 per year. 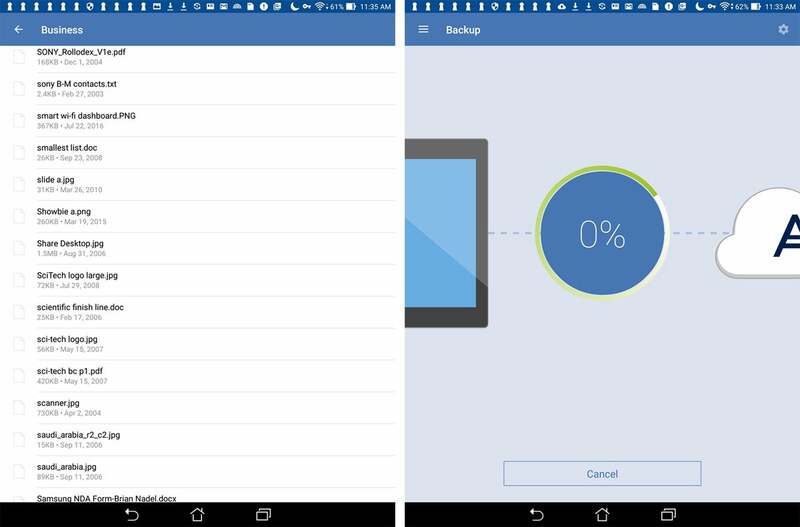 At 498MB, the Acronis app is the largest of the group to install by a wide margin, but it is also the deepest, with a slew of utilities. It took three minutes to download and install it. The Acronis interface is clean and uncluttered. The column on the left provides quick navigation to functions such as backup, archive and sync, as well as to a dashboard that provides access to backups of your computer, your phone and tablet, and your Facebook material. The backup screen shows the file flow from local system to cloud, including a progress bar. It has convenient “Back up now” and “Recover files” buttons. True Image can run a full backup, or you can choose to exclude some file types from the backup process. Backups can be scheduled at daily, weekly or monthly intervals, or Acronis can continuously back up files as they’re saved. It can also be set up to automatically perform a full backup after a restart or shutdown. You can also set up True Image to do backups only when your system is idle, choosing between optimal and maximum speeds. Overall, I found that the True Image 2018 interface provided the best balance between getting a good overview and getting things done. It’s easy to find what you need, and at any time you can dig deeply to change what is being backed up and whether it’s being saved locally or online. On the downside, you can’t just drag and drop files or folders that you want to back up, but instead must select them from a Windows Explorer-like interface. One thing that distinguishes Acronis from its peers is its use of blockchain technology as part of its Notary feature, which helps determine whether someone has altered your online archives. Notary issues a certificate attesting to a file’s authenticity from Ethereum Foundation, a major blockchain developer. Besides Notary, True Image offers what it calls Active Protection, which senses when files are being systematically altered. It calls this “ransomware protection,” and here is the logic behind that: Security experts widely tout consistent and frequent backups as the best way to avoid paying ransoms to unlock maliciously encrypted files, but cybercriminals can short-circuit that protection by messing with your archived files as well as those on local systems. When True Image detects behavior that doesn’t match what it has learned about how you interact with your archived files, it stops the activity and restores your backup files. It can be set to automatically restore the original file. 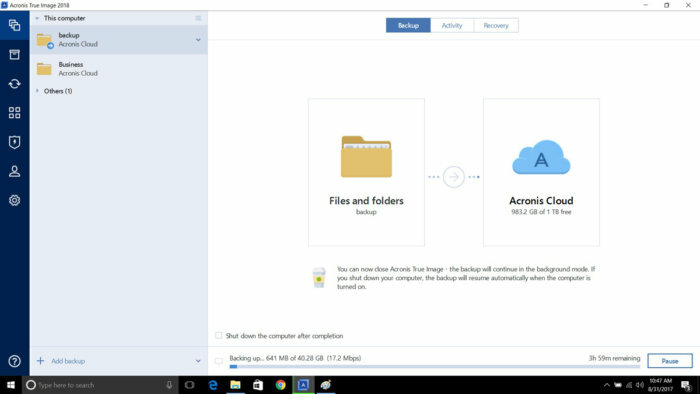 Besides the online backup, you can have True Image archive files locally on an external drive, but Acronis will neither send you a drive with your files (as Carbonite does) nor allow an initial hard drive upload (as IDrive does). The True Image app is available for Windows, macOS, iOS and Android, but you don’t have to use the app to retrieve files; most web browsers, including Chrome, Internet Explorer, Edge and Firefox will work. Searching for a document to restore (left) and starting a backup (right) using the Acronis Android app. On top of backup, Acronis provides a wide variety of utilities, such as system and drive cleanup apps. The software provides the means to easily clone a hard drive or set up a protected partition on an external hard drive for local backups. True Image 2018 is for those in a hurry. At 2 hours, 49 minutes and 11 seconds, it did the fastest initial backup — one-fifth the time of the Mozy backup. Its 4.13MBps throughput was the best of the bunch. The service took 41.2 seconds to perform an incremental update, which was slightly slower than Carbonite’s 30.8 seconds, but it was essentially tied for fastest at restoring a 130KB image file, taking 8.1 seconds to Mozy’s 8.2 seconds. And the service took only 5.1 seconds to transfer that same 130KB image file from the cloud storage to my Android tablet, the fastest of the lot. At $100 for a year’s worth of 1TB of storage space, Acronis True Image 2018 Premium is a great value. Besides storing all your files, it protects against ransomware intrusion and uses blockchain technology to prove that the backups haven’t been tampered with. For Acronis, security is a true differentiator. No other backup service provides more peace of mind for the money. File retrieval isn’t restricted to one machine, though. In fact, Carbonite has mobile apps for Android and iOS devices, and you can also use a web browser to grab any saved file. What’s more, Carbonite offers a backup of your backup. If for some reason you can’t rebuild your data from the online repository, Carbonite’s Courier Recovery Service will ship you a USB hard drive containing every backed-up file. For Carbonite Prime customers, this service costs $10 per use, including shipping, but the company charges $130 if you don’t return the drive. (The charge is $100 for Basic and Plus customers, so one use would double a Plus customer’s annual backup costs — and more than triple them if you don’t return that drive.) For Prime customers, it’s a bargain compared to Mozy’s similar feature. 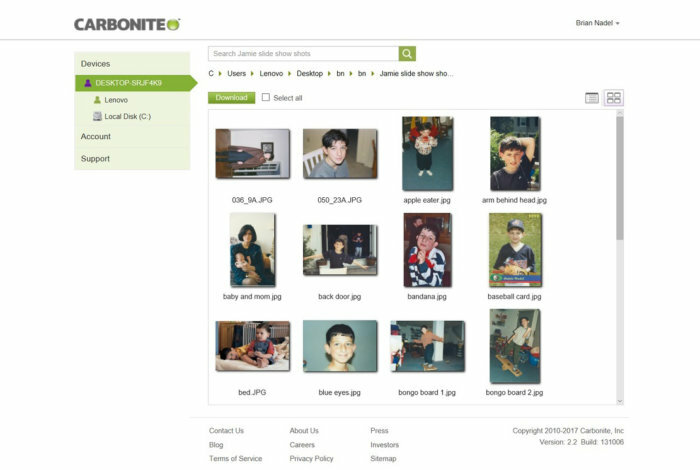 Carbonite’s desktop file recovery interface lets you browse or search to find the files you want to recover. The 15.9MB program takes about three minutes to get and install. Once the software is installed, you can take a tour of its features, and you will be asked whether you want to store the 256-bit AES encryption key yourself or have Carbonite manage it for you. Keep this in mind, though: If you choose to hold your encryption key, you can’t use the mobile apps to view files. Carbonite’s unlimited storage might lose some of its luster in your eyes when you see the types of files and folders it won’t back up, at least not automatically. Several file types (those larger than 4GB, for example, or those outside of Windows C:\Users locations, or Mac Mail and Calendar files) won’t be backed up automatically but can be included if you manually select each one. Besides that, Carbonite has long lists of file types specific to Windows and macOS that it won’t back up at all. In addition, the company holds deleted files for only 30 days and it’s a single-use license. 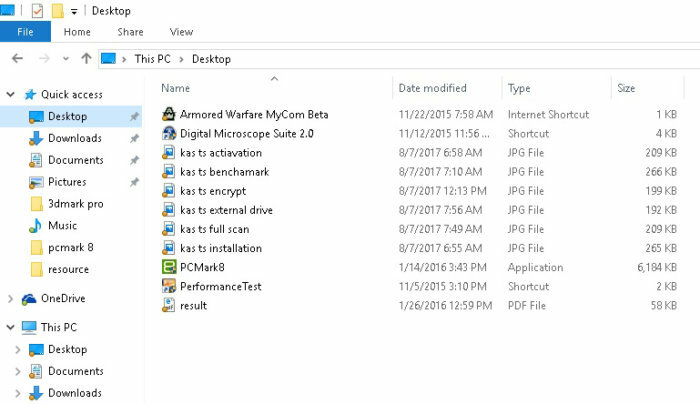 My favorite feature of Carbonite is that you can use Windows Explorer (a.k.a. File Explorer) to see which files have been backed up. Carbonite adds colored dots next to an item to show whether it has been backed up or is awaiting action; a half-filled dot next to a folder means that only some of the files it contains have been designated for backup. In Windows Explorer, small colored dots show which files and folders Carbonite has backed up. Carbonite’s half-size screen can’t be resized or moved. You can use the app to schedule backups or choose to continuously back up files, set up a nightly archive and pause the backup process. Its array of customization options pales in comparison to those offered by Acronis. During backups and recoveries, Carbonite stopped dead in the digital water a few times. Its initial backup of 37.8GB took 5 hours, 13 minutes and 6 seconds, more than two hours longer than Acronis’s initial archiving, with throughput of 2.01MBps — half that of Acronis. Its 30.8-second incremental update of 86MB was the fastest of the five. The service replaced a deleted file in 13.3 seconds for middle-of-the-pack performance, and it came in last when grabbing an online file from my Android tablet, at 18.6 seconds. At $150 per year for the Prime service, Carbonite is expensive compared to Acronis and IDrive — unless your single computer holds more than 1TB of data to be backed up. The local mirroring and hard drive delivery service are nice contingencies, but if you’re comfortable with strictly online backup (or are willing to do your own backing up to an external hard drive), the Basic and Plus plans could be good, cheaper options. Carbonite is a good option when you have one computer with a lot of data you can’t afford to lose.